They're all kaiju from Ultraman. I am not a kaiju expert and sometimes have trouble telling some of them apart, but from what I was able to tell while doing research, the characters are as follows: TOP ROW, left to right: Red King, Gomora, Bemular, BOTTOM ROW, left to right: Gomess, Alien Baltan, Gudon. Can any of you kaiju experts out there confirm whether I got that right? Their tails (and Baltan's arms) are removable, so you can pop them off and plug them back in. These six make up a full set (90% sure as I've never seen photos of any others anywhere). They're about 1.75 inches tall on average. For some reason, some of them are made out of hard plastic while others are made from soft rubber. With the rubbery ones, it's a bit hard to plug the tails in so they stay in place. Was the set released under any particular name? How were they sold? My best guess is snack food premiums, but that's only a guess. Are they bootlegs of Japanese figures or original sculpts? How many different colors were made? You can see additional colors of the same sculpts in this image from Flickr user Monochromatics Figures. Do any of you guys have any of these, or can you help answer any of these questions or shed more light on their origins? I think I have some in yellow somewhere. I'll look! The one with the triangular crest is Gomora. Awesome. I wonder where they actually originated then. 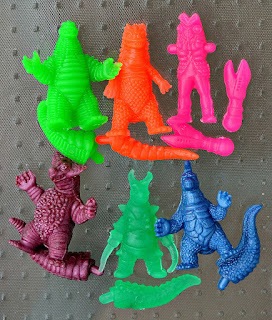 Im from mexico and i have a set of these toys, but in the set i bought Red King is totally absent and the only colors are neon pink,neon green and purple for the hard plastic ones and orange, red and green for the soft transparent ones. If I can remember correctly they were sold as generic "monster" toys in a plastic bag with a header card and they were sold everywhere, from flea markets to big name stores. I bought mine from La Comercial Mexicana, practically the mexican equivalent of Wal-Mart. 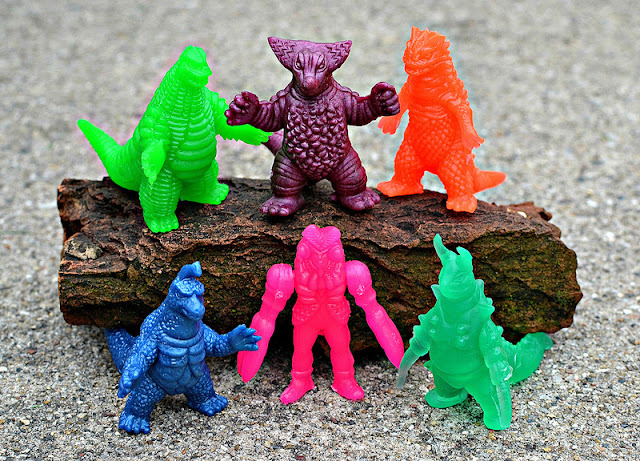 I really dont know if the sculps are original or made up but given the level of detail and how close they resemble the real Kaiju toys Im pretty sure they are bootlegs based on existing toys, maybe some gachapon toys. What is weirder to me is that these toys (well the set i bought) were sold in the 90's, early 2000's when the popularity of ultraman in Mexico was pretty much non-existent (and to this day still is :/). Thanks for the information! I was wondering when and how these figures were sold. And yes, I do believe they used existing sculpts because I have seen some of the originals in Japanese auctions.